Mature cats get very set in their ways, and can quickly turn to the dark side when new kittens join the house. Systems are needed - like Cat Team Building Sessions, Peer Support for Cats, Cat Buddy Schemes - these are very popular in the business world, where workers apparently have to be good team members. Alas, in the domestic cat world there are no training camps for inter-feline relationships. I thought Stumpy cat would be really nasty - after all, she used to terrorise the unfortunately named Lucky Puss. But no - evey night at dusk four of us go for a walk around the driveway - Head Gardener, Tiger kitten, Smoocher Kitten - and Stumpy! It's not as rosy with Jerome the cat. 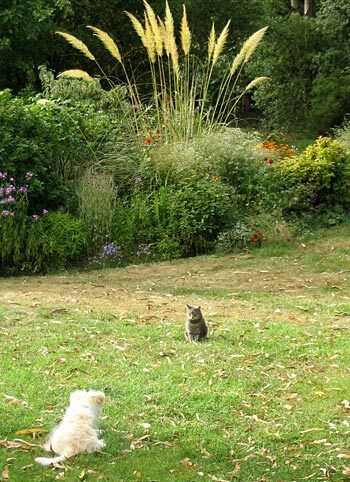 She has always been a little unsociable (of course while passionately in cat-love with the Head Gardener) and the newcomers are simply not welcome. She semi-ignores them from a hissy spitty distance. Mature cats have standards, so I expected the integration of the new puppy to be challenging. Rusty the puppy doesn't stand a chance with Stumpy the cat. He zooms around her in wide maniacal circles while Stumpy, serene and calm in the centre, watches with disdain. She doesn't even need to thicken her tail, or growl - she is completely in control. It's different for Mugsy the cat, though. Mugsy gets the bouncing-puppy treatment. She never sees him coming (Mugsy is blind in one eye) - he bounces high in the air and lands with cat under his belly. Mugsy confuses him by flailing her paws weakly, then she wriggles out and retreats to wash her bottom. When things are going a bit pear-shaped, washing one's bottom is a good idea - if one is a cat. The plan was to have new kittens at the same time as the new puppy. They could all be best friends. They could cuddle up together, snooze in the sun together, rub noses, smooch each other. 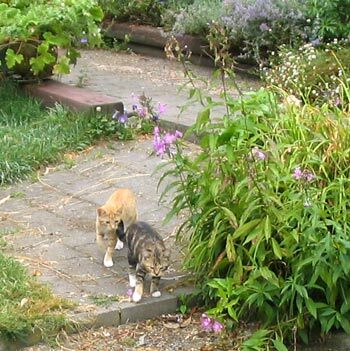 Best Laid Plans - of Cats and Gardeners? I'm not sure I dare mention my trio of fearless, free-ranging chooks, in case I'm charged with bird cruelty. The inter-species relationships are rather odd. 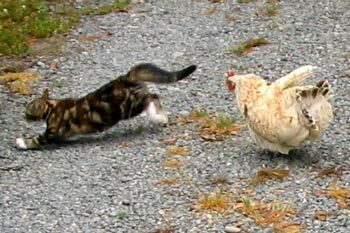 The kittens stalk the chooks, and the puppy chases the chooks (encouraging their flying skills). Stumpy the cat sneaks up and pinches their bread. Jerome the Cunning Cat hides in the Olearia hedge (scene of their afternoon scratching session) and leaps out dramatically when chook guards are down. You can imagine the noises. Chooks do lose their feathers naturally by moulting, don't they?